Worldwide, stomach cancer (also referred to as gastric cancer) remains one of the most common forms of cancer, affecting approximately 800,000 new individuals annually. However, the rate of stomach cancer has been declining in the United States and western Europe over the past half-century, a trend which has been felt attributable in large part to changes in diet during this period of time. 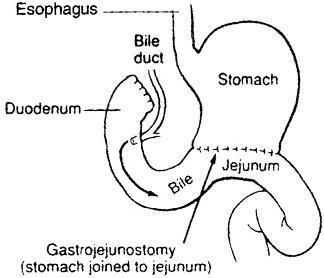 Interestingly, the incidence of cancers located in different portions of the stomach appear to be heading in opposite directions: while those located in the more distal (lower) portion of the stomach have been declining in incidence, there has actually been an increase in cases occurring in the proximal portion of the stomach (closer to the esophagus) and at the gastroesophageal junction (where the esophagus meets the stomach). Stomach cancers are classified according to their tissue type. Overwhelmingly, the most common type of stomach cancers are gastric adenocarcinomas, which arise from the glandular tissue lining the stomach. Occurring much more rarely are gastric lymphomas (also referred to as MALTomas, or mucosal associated lymphoid tissue tumors), carcinoids, and sarcomas. The ability to distinguish between these types of cancers is a critical one, as the specific treatment for each may differ significantly. The discussion which follows will concentrate specifically on gastric adenocarcinomas. Furthermore, gastric adenocarcinomas are further subclassified according to their gross appearance (polypoid, fungating, ulcerated, or infiltrative); their histologic features (intestinal or diffuse); and their location within the stomach (cardia, corpus, or antrum). A rare subtype of stomach cancer is scirrhous carcinoma, or linitus plastica, a poorly differentiated mixture of mucin-producing carcinoma cells that infiltrates the muscle wall and turns the stomach tissue rigid and leatherlike, limiting its distensibility and preventing normal digestion. Gastric adenocarcinoma may spread via direct extension through the stomach wall into adjacent organs (spleen, pancreas, colon, esophagus, diaphragm). Alternatively, cancer cells may spread through lymphatic channels to lymph nodes in the abdomen or chest, and even rarely to the left supraclavicular (neck) lymph nodes. Metastases through the bloodstream can result in the cancer spreading to distant organs such as liver, lungs, and bones. Direct peritoneal seeding can produce malignant ascites (fluid accumulation in the abdomen). In women, stomach cancer can spread to the ovaries, referred to as a Krukenberg tumor. Diet appears to play a major role in the development of stomach cancer. Nitroso compounds such as nitrites (found in smoked meats and fish) and nitrates (used in food preservatives), and high salt intake, likely contribute to this disease, whereas fresh vegetables are protective. The question of whether green tea also has any protective effects remains debatable. A bacteria called Helicobacter pylori represents an additional risk factor for gastric cancer, particularly those cancers occurring in the distal portion (antrum) of the stomach. This infection may lead to inflammation of the superficial layer of the stomach, inducing changes in the cells that line the stomach which eventually results in cancer. It should be stressed, however, that most patients with H. pylori infection do not develop gastric cancer. The independent association between peptic ulcer disease (PUD) and stomach cancer remains questionable, although H. pylori infection is known to be a risk factor for both. Autoimmune gastritis (associated with lack of hydrochloric acid secretion in the stomach and pernicious anemia), and adenomatous gastric polyps, represent other precursors that increase a person's risk of developing stomach cancer. Chronic GERD (gastroesophageal reflux disease) can cause damage to the tissue lining the lower portion of the esophagus and first portion of the stomach (cardia), resulting in the development of cancer at the G-E junction. Finally, gastric cancers are seen at increased frequency in certain familial cancer syndromes, such as hereditary non-polyposis colon cancer (HNPCC) and the E-cadherin familial stomach cancer syndrome (associated with the diffuse form of stomach cancer). The symptoms of stomach cancer often mimic those of peptic ulcer disease, namely a vague upper abdominal pain aggravated by food, heartburn, and indigestion. These symptoms are often initially treated with antacids and H-2 blockers. Loss of appetite and early satiety (feeling full after eating only a small amount of food) are other common symptoms. Large stomach cancers may result in partial blockage of the digestive tract and cause patients to vomit after meals. Stomach cancers may also bleed, resulting in the vomiting of blood or the appearance of black, tarry stools (melena). Diagnosis is most frequently made by upper endoscopy, a procedure whereby a gastroenterologist can visualize the lining of the esophagus and stomach by insertion of a long tube attached to a camera. Biopsy of any suspicious lesions can usually be performed during this procedure to confirm the diagnosis. Further evaluation should include physical examination to look for enlarged lymph nodes (particularly in the left supraclavicular region), enlarged liver, and ascites (fluid in the abdomen); routine blood work; chest X-ray; and a computerized tomographic scan of the abdomen (and pelvis in females). Stomach cancer is staged by the TNM system. T refers to the depth of penetration of the tumor through the wall of the stomach and whether it invades into local structures; N refers to the presence or absence of lymph node involvement near the stomach; and M refers to the presence of absence of metastatic spread of tumor to distant sites in the body. This staging system is important in guiding treatment decisions and offering prognostic information to the patient. For example, early stage gastric cancers can be cured upwards of 50 percent of the time, whereas cancers which have metastasized to distant organs have a very slim chance of long-term survival (< 3 percent). From a treatment standpoint, the first question to address is whether the cancer is operable or not. This depends on a number of factors, including its location, how bulky the tumor is, whether it invades surrounding structures, the extent of lymph node involvement, and whether the individual is strong enough to undergo a major operation. Cancers arising in the lower portion of the stomach have better cure rates than those arising in the upper portion of the stomach. Cancers that have metastasized to distant organs cannot surgically resected with curative intent; however, in certain instances they can be resected for palliative purposes (for example, if they are causing severe obstruction or bleeding uncontrollably). Bulky tumors in the upper portion of the stomach and the GE junction are sometimes treated first with chemotherapy and radiation (neoadjuvant therapy), with the idea to shrink them enough to permit a better chance of resecting the entire tumor. Cancers of the upper portion of the stomach are generally treated with a total gastrectomy, whereas patients with cancers of the lower portion of the stomach undergo partial gastrectomy. These surgeries are major undertakings and require reconstruction of the digestive tract (see accompanying figures), plus removal of surrounding lymph nodes. Following surgery, adjuvant treatment has been shown to improve outcomes. This treatment typically consists of a combination of external-beam radiation and concurrent chemotherapy, most often a drug called 5-fluorouracil. Another recent study showed that an alternative strategy for resectable patients is to administer combination chemotherapy both before and after surgical resection. For patients with metastatic disease at the time of diagnosis, the mainstay of treatment is chemotherapy. Aggressive combination chemotherapy regimens can produce an objective response in upwards of 40% of patients. Patients may develop deficiency of certain vitamins and minerals that require the stomach/gastric acids for normal absorption, such as vitamin B12 and iron. These should be supplemented as needed. The dumping syndrome is common after surgery because food passes so quickly through the digestive system that there is little time for absorption. Symptoms of dumping syndrome include abdominal cramping, diarrhea, sweating, racing heartbeat, nausea, and dizziness. These symptoms frequently get better the further out from surgery you get. Eating several small meals throughout the day rather than three square large meals, and eating foods lower in carbohydrate, can help. Discussion with a nutritionist is highly recommended. Symptoms of upset stomach may be related to alkaline backup, or reflux, of bile and intestinal secretions into the esophagus. These symptoms can be controlled with medicines such as Maalox, Mylanta, and sucralfate (H2 blockers are not needed if the antrum [gastrin-producing part of the stomach] is removed), as well as by simple measures such as sleeping with the head of the bed elevated and staying upright for at least an hour after eating. Occasionally, bacteria can grow in the loop of the duodenum (first portion of the small intestine) bypassed by a connection of the stomach to the small intestine, producing what is called blind loop syndrome. These bacteria breaks down bile salts needed to properly digest fats, resulting in diarrhea and abdominal bloating. This condition can be treated with oral antibiotics. Many patients will not be curable by an operation at their time of presentation due to the advanced stage of their disease. However, those with bulky tumors that are causing pain, bleeding, or are impeding passage of food, can still be treated in a variety of fashions to relieve their symptoms. These include a more limited form of surgery to bypass the tumor; an abbreviated course of radiation treatment; or placing a stent across the obstructed area to allow food to pass through more readily. Because chemotherapy does also frequently produce a good response, if local symptoms are not too severe then it is often reasonable to see if they may be effectively palliated with chemotherapy alone. 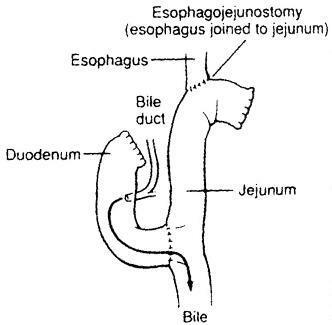 For those patients in whom eating becomes difficult or impossible due to the bulky nature of their tumor, then placement of a feeding tube into the jejunum (called a J-tube) can be performed by a gastroenterologist or interventional radiologist to provide nutritional supplementation by this means. As is the case with other cancer types, patients with advanced stomach cancer may also require aggressive pain management with escalating doses of narcotics. Am I an appropriate candidate for surgery? If so, what type of surgery would be performed, and what postoperative complications might I face? Should I receive postoperative chemotherapy and/or radiation? If surgery is ruled out, what treatments would you recommend, how likely are they to work, and what are the possible side effects? How can I receive palliation of my pain/difficulty eating/nausea?